After seeing the King's Castles we headed back to our hotel in Garmisch (technically the full name is Garmisch-Partenkirchen) for a little R&R. The views of the mountains along the drive home were incredible. After resting for a bit, we headed out to see all that we could see in Garmisch-Partenkirchen. I spy a hang glider! Garmisch-Partenkirchen is a mountain resort town in Bavaria, southern Germany. 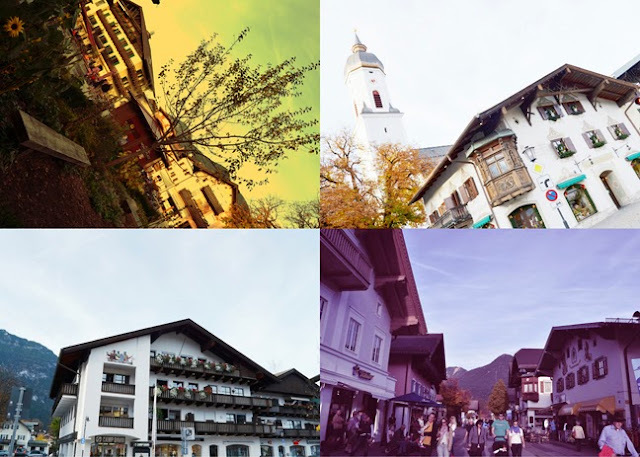 It is the administrative center of the district of Garmisch-Partenkirchen, in the Oberbayern region, and the district is on the border with Austria. Garmisch (in the west) and Partenkirchen (in the east) were separate towns for many centuries and still maintain quite separate identities. 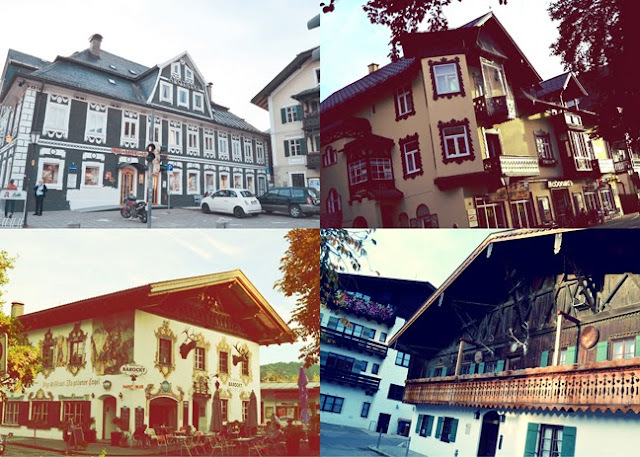 Partenkirchen originated as the Roman town of Partanum on the trade route from Venice to Augsburg and is first mentioned in the year AD 15. The main street, Ludwigsstrasse, follows the original Roman road. 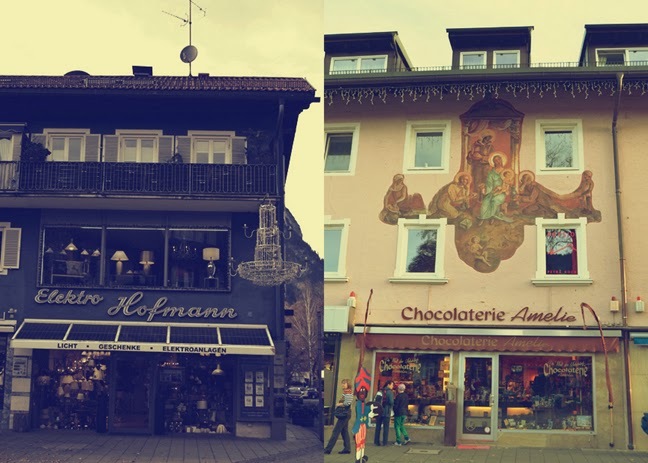 Garmisch is first mentioned some 800 years later as Germaneskau ("German District"), suggesting that at some point a Teutonic tribe took up settlement in the western end of the valley. We had to pause to look at the chickens! And we stopped to admire these pretty flowers - I want some of the dangling vines in our backyard! During the late 13th century, the valley, as part of the County of Werdenfels, came under the rule of the prince-bishops of Freising and was to remain so until the mediatization of 1803. The area was governed by a prince-bishop's representative known as a Pfleger (caretaker or warden) from Werdenfels Castle on a cliff north of Garmisch. The discovery of America at the turn of the 16th century led to a boom in shipping and a sharp decline in overland trade which plunged the region into a centuries-long economic depression. The valley floor was swampy and difficult to farm. Bears, wolves, and lynxes were a constant threat to livestock. The population suffered from periodic epidemics, including several serious outbreaks of bubonic plague. Adverse fortunes from disease and crop failure occasionally led to witch hysteria. Most notable of these were the notorious trials and executions of 1589-1596, in which 63 victims - more than 10 percent of the population at the time - were burned at the stake or garroted. The castle Burg Werdenfels, where the accused were held, tried, and executed, became an object of superstitious horror and was abandoned in the 17th century. Garmisch and Partenkirchen remained separate until their respective mayors were forced by Adolf Hitler to combine the two market towns in 1935 in anticipation of the 1936 Winter Olympic games. 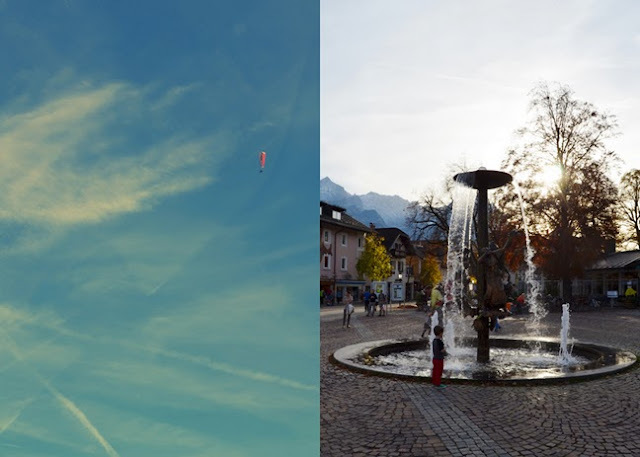 Today, the united town is casually (but incorrectly) referred to as Garmisch, much to the dismay of Partenkirchen's residents. 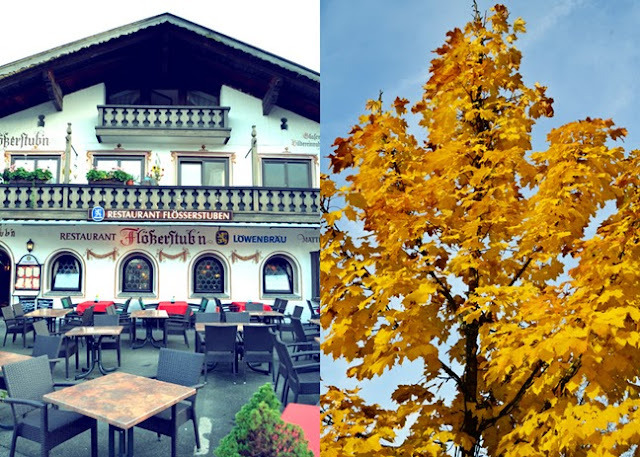 Most visitors will notice the slightly more modern feel of Garmisch while the fresco-filled, cobblestoned streets of Partenkirchen offer a glimpse into times past. 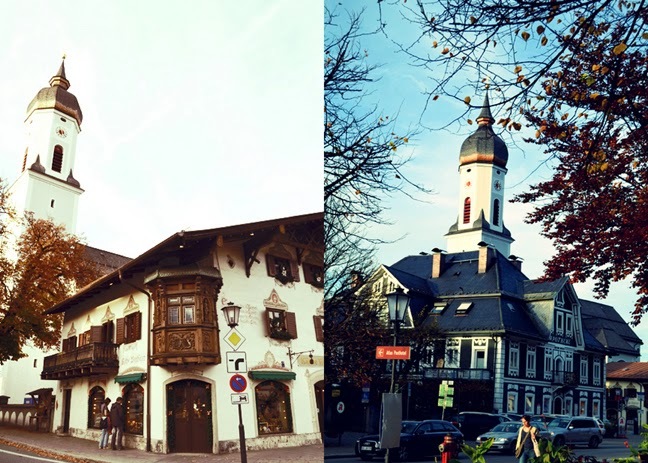 Garmisch-Partenkirchen - you are a beautiful town and I hope to grace your presence again, maybe when it's snow-covered?! Back at the hotel we ate a buffet dinner at one of the restaurants. I thought it was good! Lots of people told us the food would be sub-par, but anything I don't have to cook is yummy in my book! After dinner we went swimming! Fox LOVED it. Jane was splashing around in her life jacket, cute as can be. We checked the weather for the next day and it looked like a gorgeous morning so we planned to go up to the top of Zugspitze - the tallest mountain in Germany! I really enjoyed our evening in Garmisch. It was a very pleasant town to stroll and just enjoy the gorgeous atmosphere of the mountains and valley. Plus, what awesome weather we had! Beautiful time to visit this lovely place with lots of history! Thanks for taking the time to write up these posts!